Please note: the library's microfilm reader/printer is broken. You may view microfilm, scan or photograph the screen, and take notes -- but printing is not currently available. Manchester District Library maintains a collection of materials on the history of the Village of Manchester and surrounding townships (Bridgewater, Freedom, Manchester, and Sharon). These include old issues of the Manchester Enterprise on microfilm, published histories of the area, collections of old photographs, original typed or handwritten records, and newspaper clippings. Access to most of these materials is restricted to supervised use in the Claire Reck Local History room, which requires making an appointment in advance. If you'd like more information, you're welcome to email history room volunteers at localhistory@manchesterlibrary.info. Issues of the Manchester Enterprise for the time period October 1867 through December 1996 are available on microfilm. (Some issues were not available at the time of filming.) Please make an appointment ahead of time to get help from staff on using the microfilm reader, as improper use can lead to damage of the film and/or equipment. There is a bound index in this room for the Manchester Enterprise, listing people and topics included in the Manchester Enterprise between the years 1867 and September 1916. Unique archival materials, fragile materials, and other files are available to researchers by appointment in the Claire Reck Local History Room. Volunteers are available to researchers at designated times. Currently the library has a volunteer available on Tuesday afternoons. However, calling the library to check that a volunteer is available is advisable. Because we are a small library with a very small staff, immediate access to the collection cannot be guaranteed. To request an appointment call the library at 734-428-8045. Useful items in the local history room include: files on local topics, files on Manchester family names, photo albums, Manchester High School yearbooks (dating back to the first schools in Manchester), manuscript histories of Manchester, and old records from local organizations. 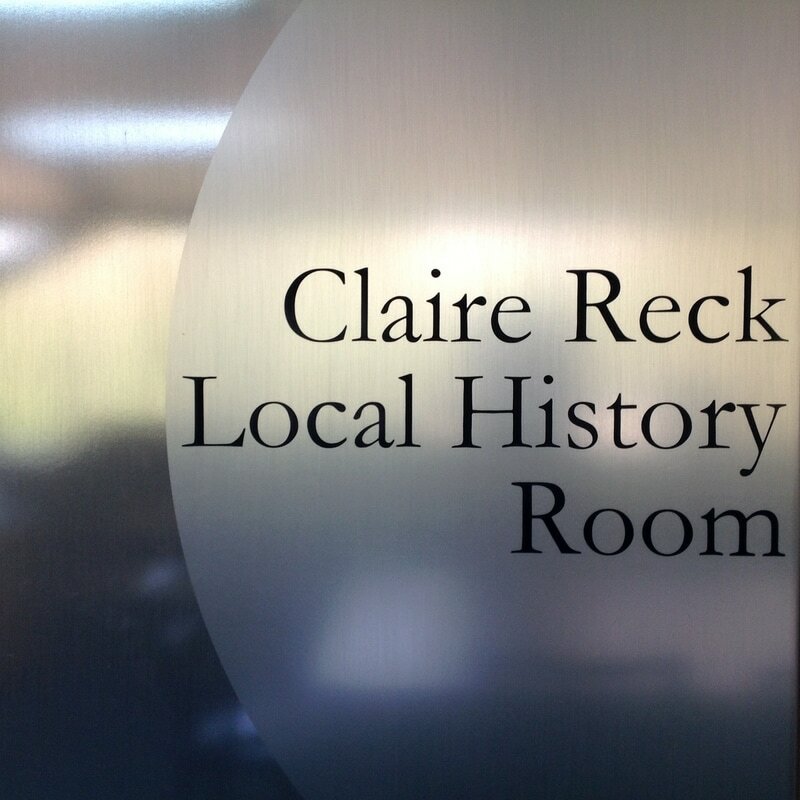 Our local history room is named in memory of Claire Reck, a long time advocate of the Manchester Township Library and well-loved member of the Manchester community. Use of materials in the Claire Reck Local History Room is governed by the Library Board's Historic Room Policy. Collection of alumni contact lists available for research. Sanborn Fire Maps, dating back to the 1870's. Manchester Historical Society calendars, dating back to 1984. These are a treasure trove of information on local schools, businesses, and farms. Collection of several boxes and albums of old photographs, many of which have unfortunately yet to be identified. Several plat maps dating back to the 1800's. Published by the Manchester Area Historical Society, this is the best place to start for those interested in the history of the area. Copies are available for loan. Includes short histories of each township. Booklet contains reproductions of old photographs. History of Manchester's famous chicken broil. Copies available for loan. The Library has useful materials for researching families from the Manchester area. For research beyond Manchester, the library has access to the HeritageQuest database and a list of other recommended sites for on-line research (see the sidebar for some of our favorites). We also have how-to books on geneaology research. The physical local history collection includes information about the Oak Grove cemetery in Manchester, including a list of military veterans buried there. For further assistance with genealogy research, please visit our "Resources for Genealogy Research" webpage.